Landis+Gyr, is a publicly listed, multinational corporation with 45 subsidiary companies in over 30 countries and headquarters in Zug, Switzerland. Landis+Gyr makes meters and related software for electricity and gas utilities. Landis+Gyr was originally known as Electrotechnisches Institut Theiler and Company, established on September 11, 1905. It was renamed Landis & Gyr, after Heinrich Landis and Karl Heinrich Gyr, who followed founder Richard Theiler as managers. Landis+Gyr designs and manufactures a range of metering products, systems, and services for electricity, heat, and gas for energy utilities around the world. In 1924, Landis+Gyr opened its first overseas offices in New York and Australia. Besides metering products, with the founding of Cerberus Limited in 1940, Landis+Gyr expanded into fire safety products. Cerberus was later acquired by Elektrowatt Limited and is today a part of Siemens Building Technologies. The company was also known for producing optical phone cards until 2006. Landys+Gyr phone cards were used in many countries such as Israel, Belgium, Switzerland and more. 1976 – Landis+Gyr acquired Duncan Electric Company of Lafayette, Indiana. 1987 – Landis+Gyr acquired MCC Powers of Chicago. MCC Powers had by then been a long established entity in the US building management market. Spurred by the liberalization and deregulation of global markets, Landis+Gyr re-oriented its business, adding electronic products. Late 1990s – In the late 1990s, Landis+Gyr went through a series of different investors and owners, amongst them Elektrowatt, KKR and Siemens. 2004 – Landis+Gyr was acquired by then Australia-based Bayard Capital for an undisclosed amount. Bayard Capital had already acquired the British metering company Ampy Automation-Digilog. As Bayard Capital continued to add other acquisitions to the group, 2008 saw the Landis+Gyr name being extended to the whole group in May 2008. An organizational realignment took place under Bayard Capital's ownership. The company moved to a regional structure, assigning regional corporate structures for North America; South America; UK/Pre-Payment; Europe; and Asia Pacific. 2006 – Landis+Gyr acquired Finnish Enermet Group, and also Hunt Technologies and Cellnet Technologies, both of which are from the United States of America. 2011 – Landis+Gyr was acquired by Toshiba Corporation of Japan for US$2.3 billion. 2017 – On July 21, 2017, Landis+Gyr listed its shares (ticker symbol: LAND) on the SIX Swiss Exchange. Various utilities have worked with Landis+Gyr in meeting their consumers' demand for energy management tools by rolling out smart meters. Below are some of the utilities that have worked with Landis+Gyr in deploying smart metering technology to energy consumers. Europe, Middle East & Africa: British Gas; Iberdrola; Électricité Réseau Distribution France (ERDF); E.ON; Järvi-Suomen Energia Oy; Vattenfall; Eskom; RWE. Asia Pacific: Energex; Ergon Energy; Ausgrid; Essential Energy; Western Power; ESTA; Genesis Energy Limited; Meralco; China Light & Power; Singapore Power. North America: Oncor Energy; Pacific Gas and Electric; Hydro-Québec; AEP Texas. South America: Copel; AES Eletropaulo; Ampla – Enel/ENDESA Group; Light; CEMIG; National Electricity Administration, Paraguay (ANDE); Cooperativa Regional de Electricidad, Bolivia (CRE); EDESUR - Enel/ENDESA Group (Argentina); CODENSA – Enel/ENDESA Group (Colombia). 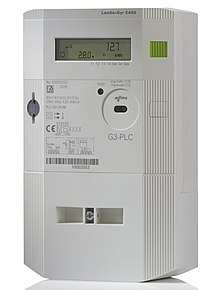 Smart metering is opposed by some[who? ], and as a developer of such meters, Landis+Gyr is met with criticism. In 2016, Phil Mocek of MuckRock started investigating  a project in which Landis+Gyr was involved. After Mocek received the requested information, Landis+Gyr followed up by filing a lawsuit  demanding the documentation not be made public. ^ "History Siemens Building Technologies". Buildingtechnologies.siemens.com. 1998-10-01. Retrieved 2012-12-17. ^ "Public Records Request: Smart meter security audit plans schedules proposals contracts discussion results (Seattle)". Retrieved 2016-05-26. ^ "A multinational demands to know who reads MuckRock". Retrieved 2016-05-26. This page was last edited on 28 January 2019, at 10:25 (UTC).